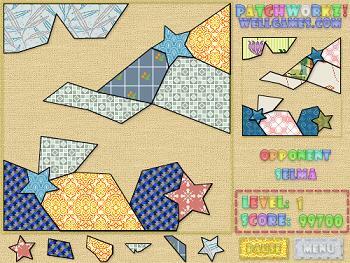 Patchworkz is a fun puzzle game that trains spatial orientation and pattern recognition. This game is multiplayer, meaning that you compete with other real players online! click the Small, Medium, or Large link or PLAY GAME button under the picture of the game at left. This opens the game in a pop-up window. The first time you play, the game will ask you to type in your name for multiplayer mode. Then click the "Play Online" button to start playing, or click the "Instructions" button for instructions. If you like this game, you might also enjoy the Numberz game. HOW TO PLAY. The object of Patchworkz is to complete a pattern using different color patches. Use your mouse to drag the patch and place it in the required spot in the picture. From the publisher: "Welcome to the world of beauty! Everything in this game is so pretty - idea, colors and addictive gameplay. "Your task is to complete a pattern using different color patches. All you have to do is to drag the patch and place it in the required spot of the picture. Meet new pictures and patterns every level and remember, that your opponent will try to complete puzzle faster than you! "Have fun, enjoy the gameplay and compete in a multiplayer mode!" Game distributed by Wellgames.com. Used with Permission.